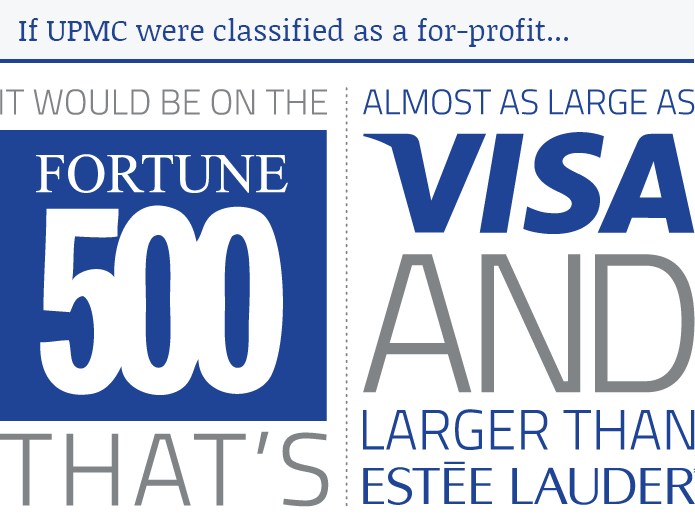 UPMC is a $10 billion global health enterprise* that made almost a billion in profits over the past two years. It’s our largest employer, our largest landowner, our largest healthcare provider, and it claims to be our largest charitable institution. number 266 if it were a publicly-traded for-profit company. foundations’ for a total of over $4.3 billion. for a total of $947.5 million. ** Hamill and Silver, op. cit. The Pennsylvania Supreme Court has defined a clear set of rules to ensure that organizations treated as charities behave as charities; UPMC simply isn’t following them. While UPMC has grown from a single local hospital to a $10 billion global health enterprise, its charitable status has gone unchecked. 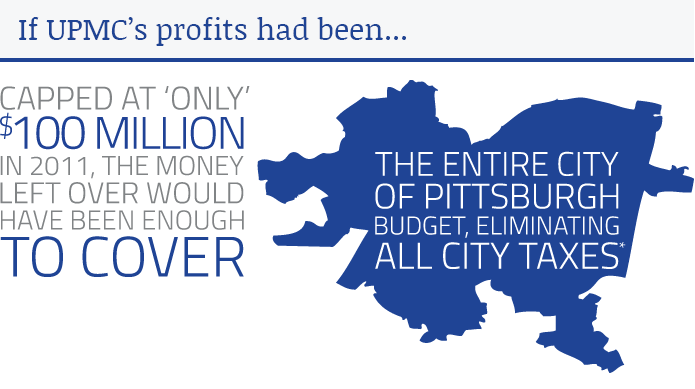 It’s time to hold UPMC accountable to taxpayers, employees, healthcare consumers, and everyone in our community. * See audited financial statements, op. cit. Note 3 to the financial statement (p. 10) shows that UPMC provided $96.2 million in charity care, valued at cost. According to the statement of operations (p. 3), UPMC had $5.26 billion in net patient revenue, after accounting for bad debts. This works out to 1.83% of patient revenue spent on charity care. If wewere to take into account UPMC’s insurance and other revenue, the percentage would be even lower.